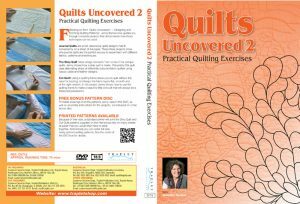 In the second DVD, Jenny moves on from the basics to showcase beautiful projects that you’ll love to make. 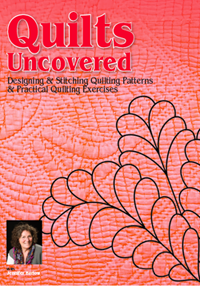 If you thought that designing your own quilting patterns was beyond you, Jenny will show that with just a little practice it is not only simple, but enthralling, engaging and deeply satisfying. Three journal quilt projects. Journal quilts are small, decorative quilts designs that fit conveniently on a sheet of A4 paper. These projects show why journal quilts give you the perfect excuse to experiment with different fabrics, patterns and techniques. How to make a strip quilt. The strip quilt takes design elements from some of Jenny’s antique quilts. This pretty little quilt uses alternating strips of differently coloured fabric quilted using classic cable and feather designs. How to use a quilting frame. 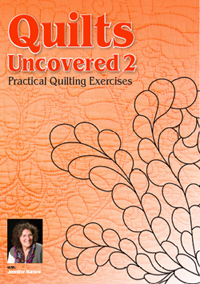 This technique allows you to quilt without the need for basting, and keeps the fabric layers flat, smooth and at the right tension. Jenny shows how to use it to make a beautiful little cot quilt that will always be a treasured possession. Printable drawings of all the patterns Jenny uses in these DVDs (as well as assembly instructions for the projects) are included on a free bonus disc in the box. NB Because of their size, a standard printer will print the patterns on many sheets of paper that you would then have to stick together.